Iran attracts a lot of media attention related to its nuclear program and the implications thereof. Sabre rattling, both by the Iranian leadership and by Western politicians and pundits, dominates the headlines and steers public discourse. But these offer a narrow prism through which to analyse and define a nation as multifaceted as Iran. For the first time in recent years the spotlight was brought onto Iran for something other than the nuclear issue when the Iranian production A Separation won the Academy Award for Best Foreign Language Film earlier this year. A domestic drama built around a moral conundrum in Tehran, it is the first Iranian film to claim an Oscar. Capturing the clamour of life in modern Iran, the movie highlights the divides that exist within Iranian society, between the haves and have-nots and between the urban middle classes and devout working classes. Each of its protagonists, while flawed, has their own moral compass by which to navigate 21st-century life. They are preoccupied with day-to-day concerns rather than with the nuclear issue or with any adherence to the ideology that underpins the Islamic Republic. As such, the film may do something to redress the notion that the broader Iranian populace is comprised of minions blindly obedient to the mullahs and antagonistic to the West. At the Oscars, writer-director Asghar Farhadi implicitly addressed this. He accepted the award on behalf of his compatriots, 'people who respect all cultures and civilisations and despise hostility and resentment'. Iran was at last being recognised for its 'rich and ancient culture that has been hidden under the heavy dust of politics'. Love and Devotion: From Persia and Beyond, an exhibition currently at the State Library of Victoria, is similarly bringing to light an alternative view of Iran. The exhibition brings to Australian shores a collection of illuminated Persian manuscripts from the Bodleian Library, Oxford; objects of intense beauty and refined artistry produced in the princely courts of Iran and the Persian-influenced domains of Turkey and India from the 13th to 18th centuries. The inspiration and subject matter for the manuscripts were the works of the master mystic poets including Nizami, Sa'adi, Hafiz and Rumi. The manuscripts' recurring motifs and themes of gardens, flowers, songbirds and notions of romantic and mystical love are not popularly associated with the Islamic Republic of Iran. Nonetheless, the works of the mystic poets and the ideas they espouse retain wide currency in modern Iranian society. At the conference associated with the exhibition, Iranian-born, Adelaide-based artist Hossein Valamanesh remarked that 'I am a lover and I'm not ashamed of it', before presenting a range of his own works that incorporate evocations of mystical love and Persian calligraphy. A constant theme at the conference was how Persian ideas and sensibilities have entered into and influenced Western art and thinking, evidence of 'contact zones' that have long existed allowing a two-way transfer between East and West, Islam and Christianity, of ideas, scholarship and creativity. Mario Casari, from Sapienza University of Rome, recounted how the director of the 16th century Medici Oriental Press in Rome claimed that Persian was a gift from God to mankind in order to express the 'conceits of poetry'. Marcelo Stamm, senior research fellow at RMIT, described how the poetry of Hafiz moved the great German poet Goethe to write his West-Eastern Divan, which in turn inspired Franz Schubert's love songs 'Suleika I' and 'II', the first of which was described by Brahms as the most beautiful love song ever written. In the exhibition itself, the biblical Joseph, of technicolour coat fame, appears in the tale of Yusuf and Zulaykha in manuscripts of the 11th century Shahnama (Book of Kings), as does Alexander the Great, recast as Iskandar, recognised by the Persians he conquered as a noble warrior and just king. The romance of Layla and Majnun is depicted in several manuscripts; Byron described this tale, with its motifs of unrequited, unconsummated love, as the Romeo and Juliet of the Islamic world. Such are some of the elements of the 'rich and ancient culture' that Asghar Farhadi recognises. This culture is not entirely alien to the West, and yet is largely overlooked in the thunder of current media headlines. William Gourlay is a post-graduate student at the Centre for Islam and the Modern World, Monash University, Melbourne. Over the last 20 years, as backpacker, teacher and journalist, he has been a serial visitor to Turkey. 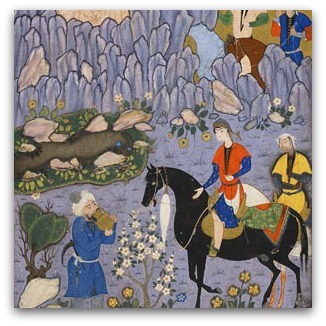 Image: Shirin visiting Farhad's milk conduit (detail), from Khusrau and Shirin. Persian Art has been devastated by the corrupt government in the last three decades. They don't give a damn about the culture. all they do care is the religion and they spend lots of money to mind control the people. I hope the Iranians some they get over it. I'm a native Persian and this is what I'm thinking about every day. That's everything from sales to selection to customer support. It is intended for, very well, personal computer gaming. At the same time, the social gaming market has exceeded with 200 million or more people playing interesting games in Facebook or any other social media platform. Along with the main mission, you will also have the chance to take on a variety of mini missions. Make use of the knowledge to monitor your children. She is called the “detective prince” by the media in the game.